When it's time to freshen up your favorite pair of sneakers, leave the elbow grease behind and give them a whirl in the washing machine. It's one of the most effective ways to remove stubborn stains and it requires very little effort. Keep in mind, though, that this method should be performed only on cotton canvas or nylon kicks. Leather or suede styles can be damaged in the washer, so it's best to clean them by hand. Step 1: Gather together your sneakers and cleaning materials. Step 2: Remove the shoelaces and inner soles, if applicable. 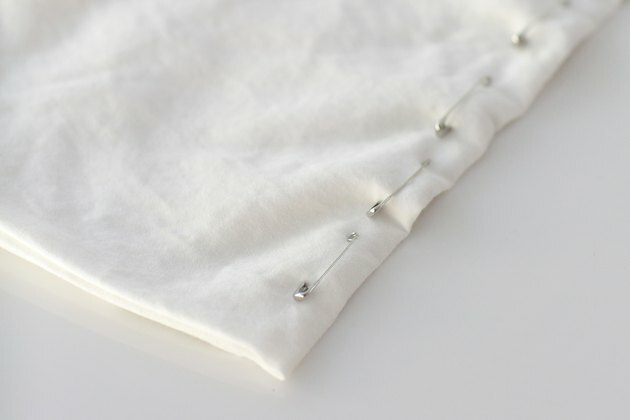 Step 3: Place the laces in a pillowcase. Fold over the open end of the case and securely close it with a row of safety pins to keep the laces from escaping and tangling while they're washing. 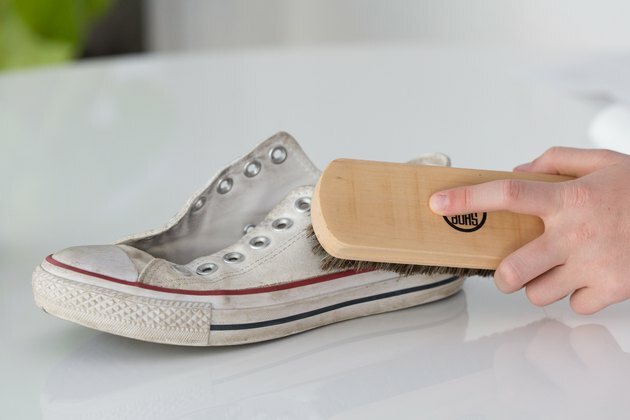 Step 4: Remove any loose dirt from the surface of your sneakers with a shoe brush. Use swift, firm swipes of the brush along the length of the uppers and across the toes. If dried-up mud is in the treads, utilize the back end of a pencil to dig through the grime and break down any excessive buildup. Step 5: Throw three or four bath towels into the washing machine and then toss in your sneakers and the pillowcase with the shoelaces. The towels act as a cushion that keeps the shoes from knocking around the machine during the wash. Step 6: Pour a capful of liquid detergent into the loaded washer. 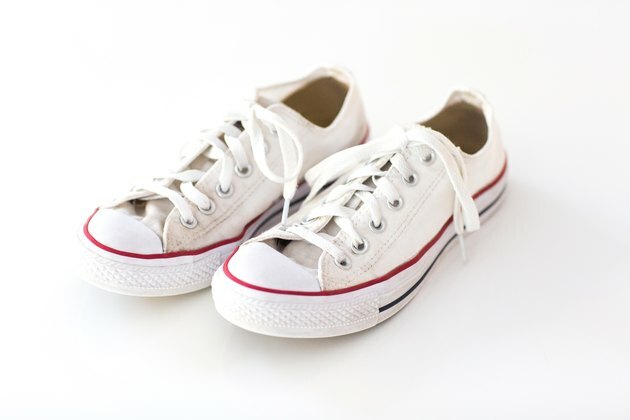 Set your machine on a delicate cycle using cold water, which will keep the colors from running and prevent the sneakers from getting misshapen. Step 7: Remove the sneakers from the washer once the machine cycle is complete. Allow them to air dry. You might be tempted to speed up the process by tossing them in the dryer, but don't: The heat could shrink the shoes or damage them beyond repair. Step 8: Remove the shoelaces from the pillowcase and hang them up to dry. Don't weave them back into the shoes -- or reinsert inner soles -- until the sneakers are completely dry. 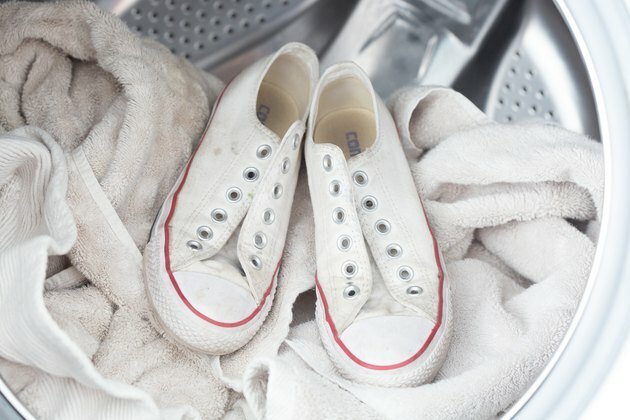 Add a cup of vinegar to your wash load to eliminate any bacterial buildup in your sneakers.